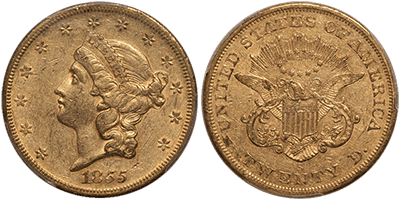 Perhaps one of the most widely popular coins struck in the San Francisco Mint is the classic Liberty Head Double Eagle. 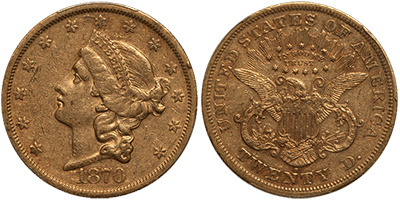 From its grand opening in 1854 all the way through 1907, the Mint struck these immensely popular Liberty Head Double Eagles. With the exception of just two issues (the 1861-S Paquet and the 1866-S “No Motto”), all of these issues can be purchased in above average condition for less than $10,000. Thousands of the Type One San Francisco Double Eagles available today were recovered from shipwrecks over a decade after they were lost to the sea. The Type One issue is different from later versions, as it does not feature the “In God We Trust” motto, which was introduced for the Type Two Double Eagle in 1866. In 1877, the Type Three issue introduced the new “Twenty Dollars” inscription, as opposed to the “Twenty D.” inscription that was seen on the Type One and Type Two versions. As a rule, Type One and Type Two issues are most readily seen in Extremely Fine to About Uncirculated grades and are usually rare to very rare in Uncirculated. Type Three issues are more often available in the lower Uncirculated grades (MS60 to MS62) and tend to be scarce in MS63 and above. It is our belief that these issues are extremely undervalued when compared to their cohorts from Carson City. The San Francisco issues are every bit as historic and, in some cases, are every bit as scarce… at a fraction of the cost. Our rare coin expert recently acquired an impressive partial date set of San Francisco Double Eagles, and we’re giving ASI readers a chance to get their hands on these coins before anyone else! Every coin (except one) has been CAC-approved, and each is characterized by choice, original surfaces and lovely natural coloration. These coins are really truly remarkable and would make for a great start to an impressive collection of these massive and highly attractive 19th century gold issues. Because they're so difficult to locate, we only have one of each coin available. Once we sell out of a date, you'll have to wait until it becomes available to the market again. And as an added bonus, we'll offer you FREE shipping if you purchase two or more of these coins! Below is the selection we currently have available for you. 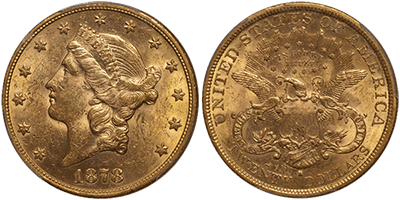 San Francisco gold Liberty Head Double Eagles are perhaps some of the most popular coins issued by the U.S. Mint, and our rare coin expert is giving ASI readers an exclusive first look at these incredible coins! To add these exceedingly beautiful and scarce U.S. gold coins to your portfolio today, please call us at 800-831-0007 or email us. *Prices subject to change based on market fluctuation and product availability. Prices reflected are for cash, check, or bank wire. Free shipping, handling, and insurance are available with the purchase of any two of these coins. Offer expires Friday, February 2, 2018, or while supplies last.